!! Make your own Mario !! 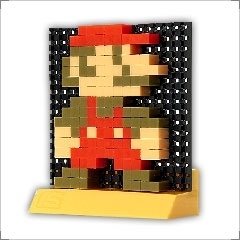 If you miss the pixellated reality of your original Nintendo Entertainment System, buy one of these cute kits that lets you assemble your favorite characters in 3-D using pegboards. I just saw these at the Magic Pony in Toronto the other day, and they have not only single figures, but also whole scenes from Super Mario Brothers, The Legend of Zelda, and other games. Be the first to comment on "Make your own Mario"